The Cantina offers handmade Southwestern favorites with a twist of Asheville. 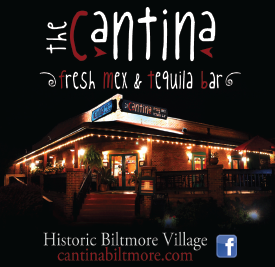 Located in the heart of Historic Biltmore Village, it is one of the jewels of the Village and Asheville.The Cantina uses only the freshest ingredients sourced locally when available. In addition to the traditional fare with a flair, The Cantina offers many vegetarian and glutensensitive options. This casual yet attractive restaurant boasts an atmosphere from familyfriendly to romantic. The Cantina offers outside patio seating available rain or shine.